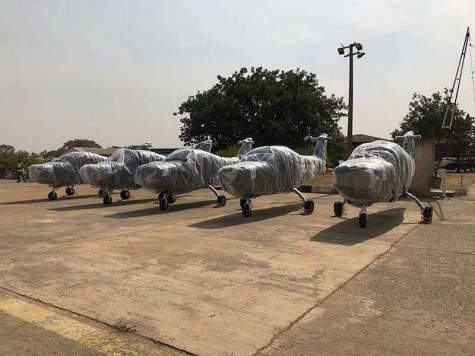 A combined team of NAF and Pakistan Air Force (PAF) personnel were also on hand to assist in offloading the new aircraft, some parts of which came in crates. In addition, officials of the Nigerian Customs Service and the Nigerian Immigration Service were present to ensure necessary documentation. The newly-delivered aircraft, which are capable of being used for acrobatics training, are all brand new and fitted with digital glass cockpit. [These five aircraft] form the final batch of a total of 10 Super Mushshak aircraft, the procurement of which the current Federal Government Administration initiated in year 2016. As at 2015, local primary flying training in the NAF was almost grounded thereby necessitating the procurement of the Super Mushshak Aircraft. Consequently, with the delivery of the new Super Mushshak aircraft, primary flying training of NAF pilots at 401 Flying Training School (FTS), Kaduna has just received a boost. Without doubts, the delivery of the aircraft would go a long way in helping to sustain the process of building capacity to effectively prosecute the counterinsurgency operations in the North East as well as other forms of criminalities in the country. It would be recalled that the NAF took delivery of the first batch of 5 brand new Super Mushshak Aircraft on 14 July 2017, following which the aircraft were inducted and deployed for primary training of NAF pilots. Furthermore, some NAF personnel had undergone training in Pakistan, as Instructor Pilots and technicians on the Super Mushshak aircraft, as part of the contract. The delivery went without any hitches and the Ilyushin 76 Aircraft has departed from Nigeria. The newly-received aircraft will now be assembled in Nigeria by a team of PAF and NAF technicians prior to test flying and formal induction into the NAF.